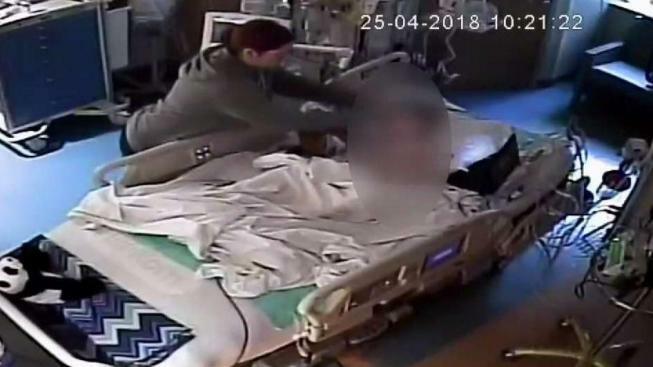 A Virginia woman who admitted putting her blood in her son’s nose and mouth while he was in the hospital said she did it because she wanted her son to get attention from the hospital staff. Elizabeth Malone, a mother of three from Fairfax County, pleaded guilty to child abuse Wednesday. Malone had recently moved from Texas to Fairfax County when her disabled 5-year-old son, who is unable to speak, was hospitalized at Inova Fairfax last spring. Malone often disagreed with his treatment, but she liked the response she saw once when the boy was bleeding. That’s why she injected her son with her own blood to recreate those symptoms, her defense said. But the prosecution said the injections left the child with infections and high fevers. In April, after a nurse saw a syringe hidden in Malone’s shirt sleeve and a bloody napkin in the bathroom, a camera was installed in the boy’s room. Video played in court shows Malone using a syringe to inject blood into the child’s trach tube and central line. Police watched the video and arrested Malone. In a police interview, Malone first denied doing anything to her son, but she broke down in tears and admitted it when detectives told her they had it on video. Since Malone has been in jail, her little boy’s condition has improved dramatically, and he is now attending school, the prosecution said. Malone will be sentenced in mid-July.